Finding the perfect gift for the geek in your life may be a difficult task, especially if that geek has everything he needs or wants. But if your geek can’t get enough of Star Trek (in spite of the several costumes he or she has in the closet for special occasions), then here is the best thing that you can get. Even if his or her birthday is not coming up any time soon, giving a gift for no reason at all is always a good idea. Enter the new limited edition of the classic board game Monopoly. Star Trek Klingon edition. It really can’t get any better than that for Trekkies, can it? The details of the entire game – properties, what the game board looks like, and so on – have not yet been revealed. We do have some videos to work with, though, and if the work that has gone into some pieces is any indication, then we are in for some good times. 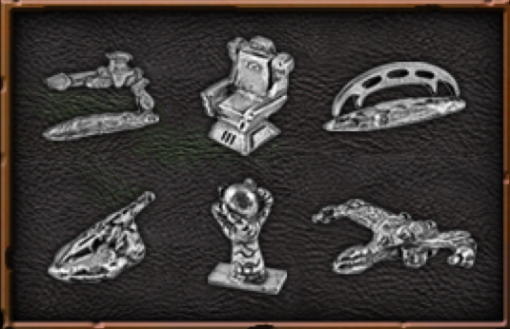 First take a look at the game tokens. And for the real deal on how they were made, nothing will do but a video. There are other videos to be found in the official page of the limited edition board game – link is shown below for pre-ordering as well. 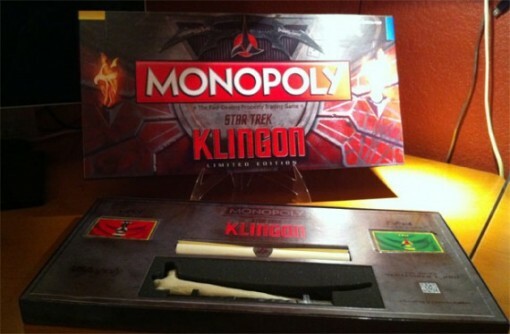 Being a limited edition board game, only be 1,701 units of Klingon Monopoly will be made. Now I am pretty sure that there are more Trekkies in the world than that, and you know what that means! The demands might just go sky high, so it would be better to place your order as soon as possible – even before the board game is released. You can pre-order over at USAopoly. ((Pre-order here.)) However, you have to wait a couple more days till the 1st of September when pre-ordering will be opened. If you want to be part of Star Trek and Monopoly history, then I suggest that you be vigilant and make sure that you get to be one of the 1,701 people who will have the honor of showing off the Klingon Monopoly board game.